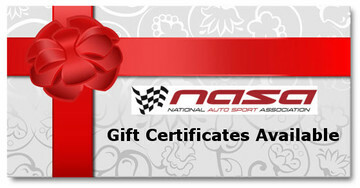 Have you ever tried to figure out what to get your car nut/racer for a gift? Who knows what doo-dads they need, what size, how many, etc. So you decide that getting them some track time would be good idea. Now you have to try to figure out - where they go, when they are going, which days? Well let's take the who - what - where out of the equation - and let THEM decide their own track time!! It's a WIN WIN deal!! This event allows you to purchase gift certificates in denominations of $50, $100, $200, $300 and $400. Once you make your purchase you will be sent a printable gift certificate with an included unique promo code. This promo code can then be used by the recipient during the check-out process towards any 2018 registration. It is a great idea for anyone who does track events or wants to try a track event. It could be a Thank You gift for a friend or crew member. It serves a multitude of purposes. ~~ Certificates are redeemable for NASA Great Lakes Region events ONLY. All drivers must adhere to all NASA Great Lakes rules, regulations and age restrictions. ~~ Please allow up to 48 hours for return email after purchase. PLEASE NOTE!!! System will ask for Driver info but purchaser can put their name and info in. When recipient registers for their day(s) their info will be collected. If you have any issues, please contact us at jay@nasagreatlakes.com.